The unknown Georgie Boy first recorded for the Thomas-McRee-Thomas organisation at the Grits’N’ Gravy studios in Jackson, MS. 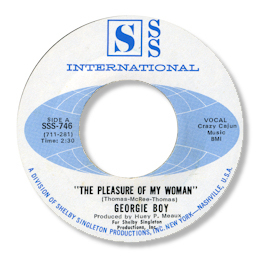 The top side of his initial release, a really good ballad called The Pleasure Of My Woman, is very tasty especially when he moves into his falsetto range. This song was also recorded with distinction by Texas artist Rocky Gil on Jetstream. The funky “You’d Better Quit It” with its clear air of menace is well worth checking out as well. “Pleasure” was also issued as his second 45 backed by the uptempo “Til He Calls My Name” recorded in Nashville. The presence of Jerry Kennedy’s electric sitar on the excellent upbeat If I Can Dream, unissued at the time, also indicates a Nashville location. Despite many years of searching I’ve no idea as to Georgie’s true name and identity – any info gratefully received. 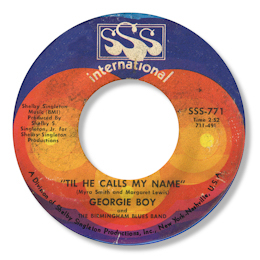 The only clue is the inclusion of the backing group “The Birmingham Blues Band” on the second 45 which might indicate that Georgie came from Alabama. Note ~ “If I Can Dream” first appeared on the P-Vine LP Louisiana-Texas Wailers” in 1987.